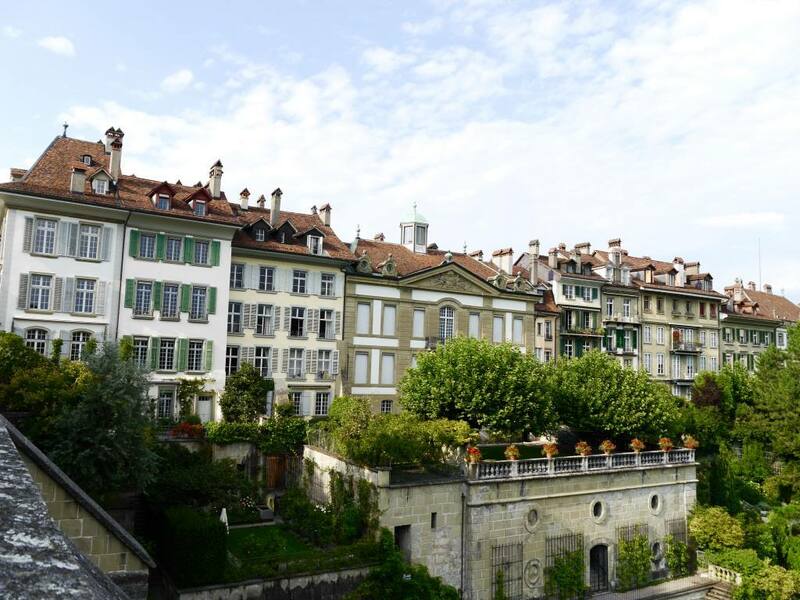 My latest adventure took me to the little-known Swiss capital of Bern, where I got to spend 3 days and 2 nights exploring the city highlights. It was the perfect amount of time to sink my teeth into this petite capital city and to tick all the ‘must-dos’ off my list. 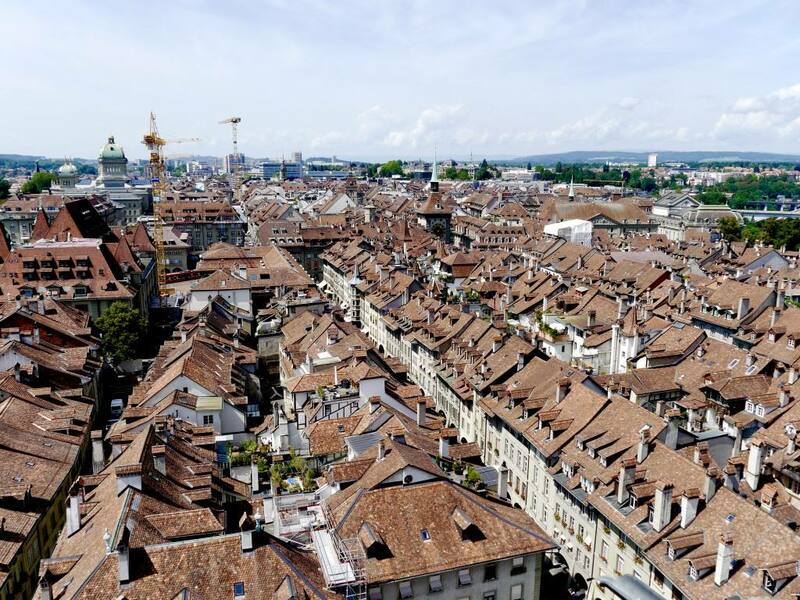 Armed with a plethora of recommendations from Bern Tourism, I embarked on my 3rd solo trip of the year and jumped two feet first into this captivating (and lesser-known) Swiss city. I’ve put together this tried-and-tested city break guide to Bern, which might just inspire your own trip to this charming part of Switzerland. When it comes to the concept of city breaks, bigger is not always better. You want to see as much as possible in 2-3 days, so covering lots of ground in a big city can sometimes be overwhelming and exhausting. 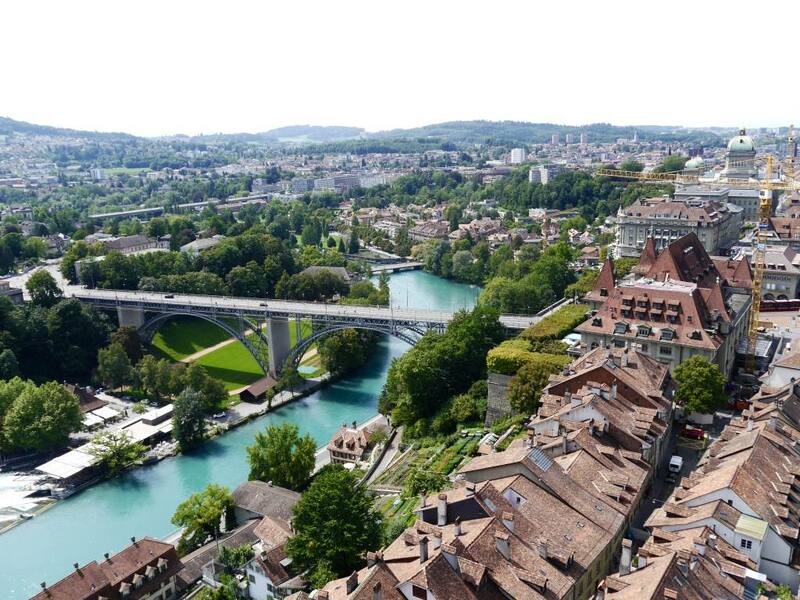 In my opinion, Bern is the perfect size for a city break. Everything is in walking distance and the main sights are in a compact area. 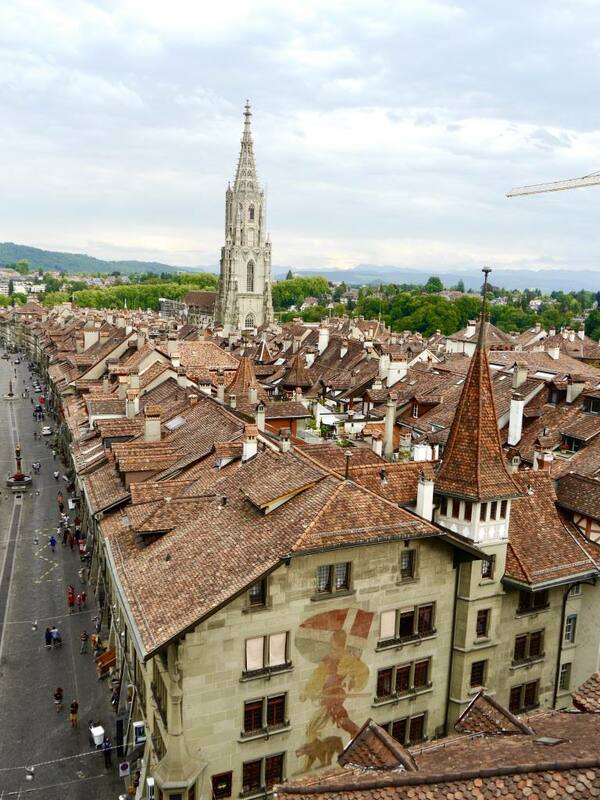 Most points of interest are in or around Bern Old Town, which is proud to be a UNESCO world heritage site. Looping round the city in a horse-shoe bend is the spectacular River Aare. Bright turquoise in colour, The River Aare is incredibly clean and swimming in it is a part of daily life for many locals. Bern is a compact city so it’s easy to walk around on foot, but the public transport system is also fantastic and tourist friendly. Trams and buses operate through the city and if you’re staying at least one night in tourist accommodation you’ll receive a complimentary ticket for unlimited public transport during your stay. 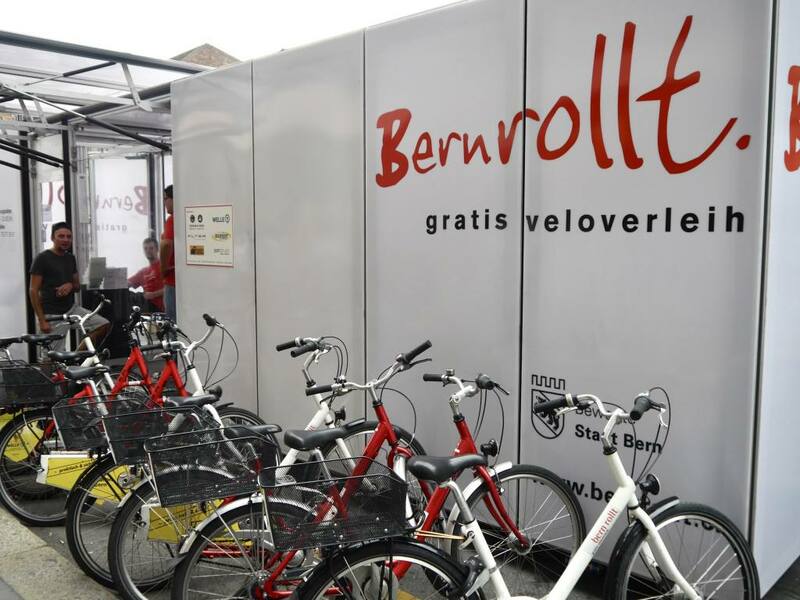 Bern also offers free bikes around the city centre. For a 20 franc deposit you’ll get free use of the bikes for four hours. These things should be top of the list for anyone visiting Bern or planning a city break to Bern. The city has an incredible medieval history, and a stroll around the perfectly preserved old town feels like a step back in time. The cobbled streets are lined with 6km of covered arcades, which date back to the 15th century. Within these arcades you’ll find a combination of charming boutique shops, restaurants, wine bars and international brands. It’s worth keeping some time free simply just to stroll through the streets. Right in the heart of the Old Town is the famous Zytglogge Clock Tower. The main attraction is watching the glockenspiel chime, which happens every hour on the hour. 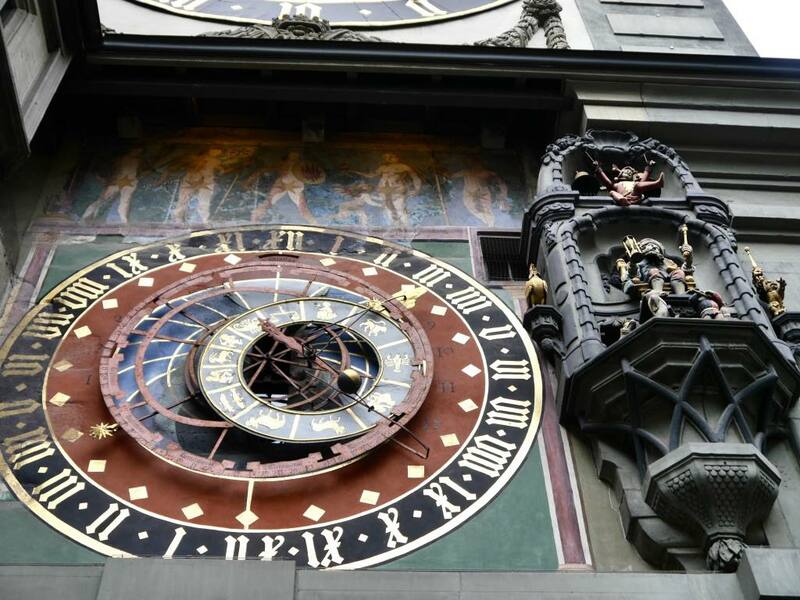 The complex mechanism within the clock tower operates the elements of the glockenspiel and it’s mind-blowing to think it works exactly the same as when it was created in 1527. Tours take place every day at 2.30pm when you can ascend up to the top of the Clock Tower to see the inner workings of the mechanism and incredible views of the city. Towering over Bern on the other side of the river is the Rose Garden. Take the path up the hill and you’ll be rewarded with incredible views over the city. It’s here you can really appreciate the unique horse-shoe river bend and the Old Town that sits within it. It’s beautiful at any time of day, but at sunset the area really comes alive. Bring a picnic and sit on the grass or head for dinner at Restaurant Rosengarten for stylish dining with a view. Bears have lived in Bern for over 500 years and are the emblem of the city. Historically they lived within a bear pit by the River Aare. Now that time (and animal welfare) have evolved, the bears live in a BearPark that covers nearly 6,000 square meters. They roam free in the park on the banks of the River Aare and even have a designated swimming area in the river. 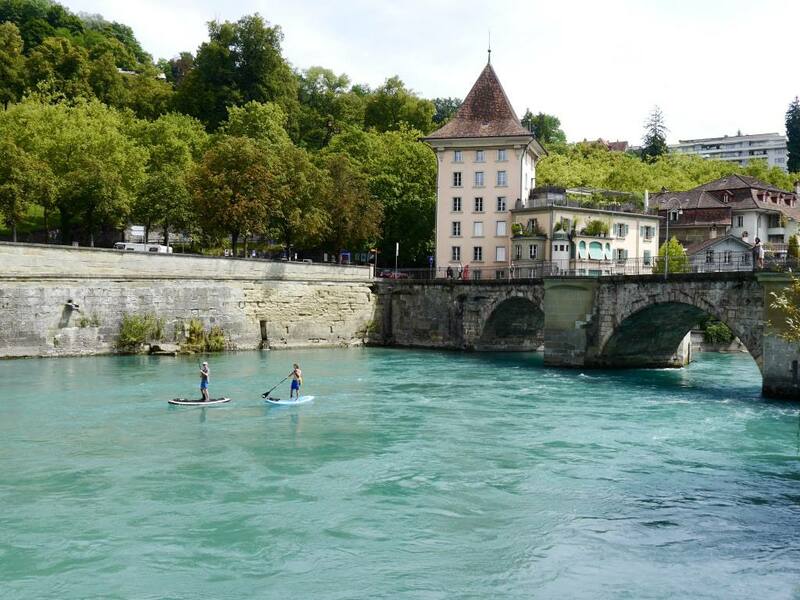 A unique culture revolves around the River Aare in Bern, which is fascinating to see. The water is incredibly clean and locals love to swim in the river on a daily basis during the summer months. On Sundays locals, sail a dinghy (or a ‘gummy boat’) down the river with friends and family. If you fancy taking the plunge, there are official spots along the river where you can get in and get out. Locals are more than happy to help newbies get in and out of the water, but it’s not advisable to go alone. Another highlight that will get your heart pumping is a trip to the top of Bern Münster. Step inside and marvel at the incredible carving and stonework before climbing the 222 steps to the very top. Here you’ll find the best (and highest) views of the city and you can walk 360 degrees around the panoramic viewing platform. Entry to the tower costs 5 Francs. Einstein studied in Zurich and later lived in Bern, where he developed his theory of relativity. There are references to Einstein all around the city, but the Einstein Museum is the highlight. 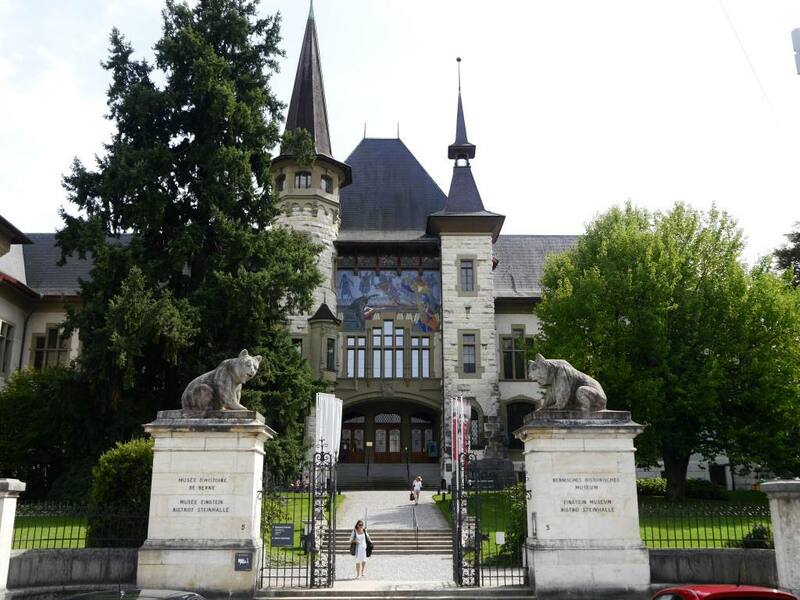 The Einstein Museum takes a permanent residency at the Bern Historical Museum and curates his fascinating life from start to finish. You can also visit the apartment he lived in on the third floor of Kramgasse 49. 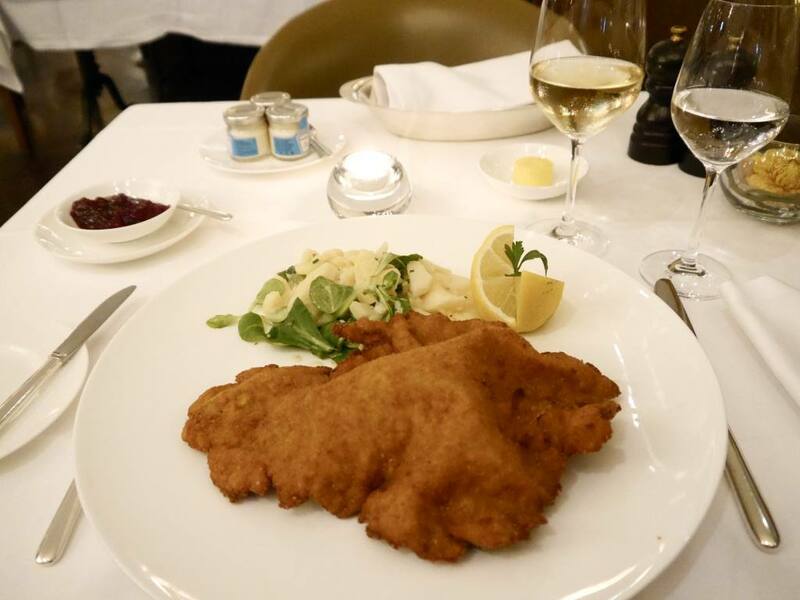 Jack’s Brasserie is somewhat of an institution in Bern and is famous for it’s signature Veal Schnitzel and French cuisine. 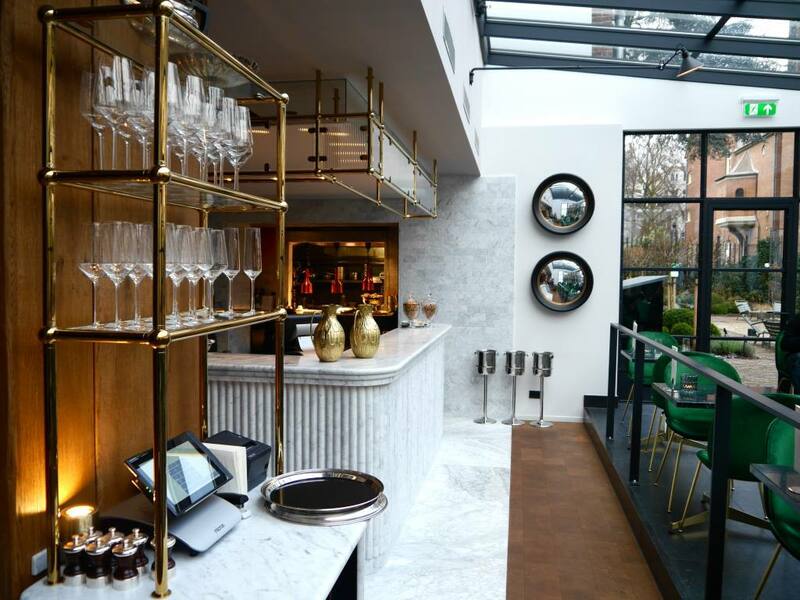 Although situated in the newly refurbished Schweizerhof Hotel, Jack’s Brasserie remains untouched and maintains it’s original 1920’s decor. 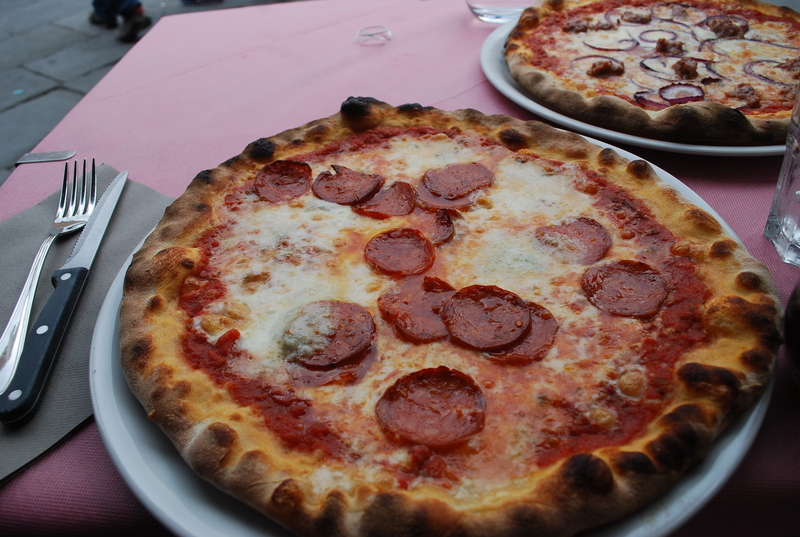 I dined here during my trip to Bern and thought both the food and service was fantastic. Great for an upmarket dinner option. Hidden away under the streets of Bern Old Town is this old vaulted cellar and granary, which is now a fine-dining Italian restaurant. The space is incredibly atmospheric and the dim lighting make it feel very romantic. I dined from a set menu so didn’t get my personal choices here but the dishes were fresh and flavoursome. If you don’t fancy staying for dinner you can also enjoy a drink in the bar. Find out more about Kornhauskeller. 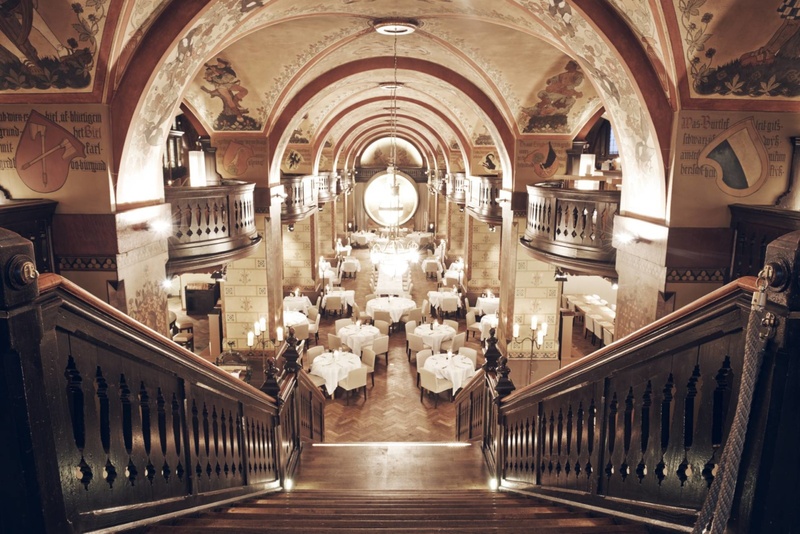 This has to be one of the most picturesque spots to dine in Bern. 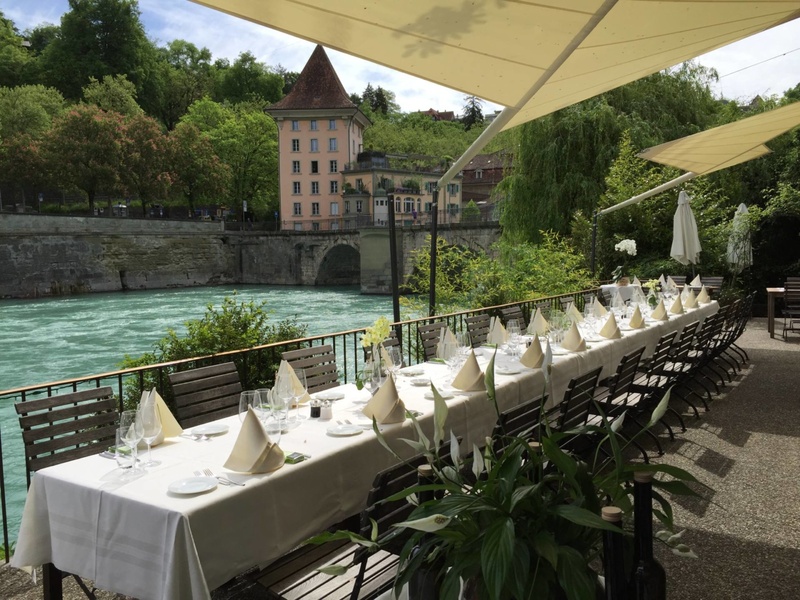 Located right on the River Aare, it’s the perfect place to stop for lunch and watch all the action on the river. But be warned, Casa Novo (and most other restaurants in Bern) close their kitchens after lunch at 2.30pm, so be sure to head there around 12.30pm if you want a leisurely lunch. It’s not a restaurant, but if you need to stop for a sweet treat be sure to head to Eiswerkstatt for a gelato. 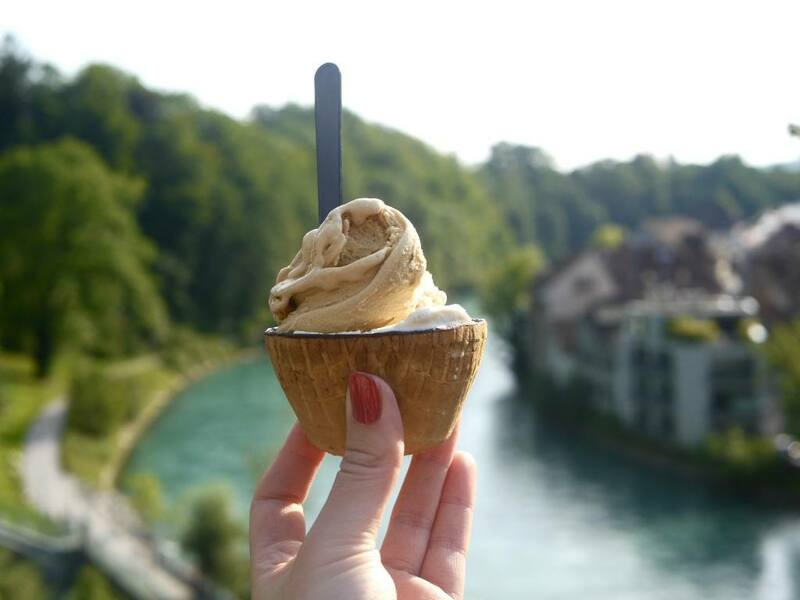 Bern is becoming increasingly known for it’s gelato due to the national success of Gelateria di Berna, but now Eiswerkstatt has popped up serving intriguing gelato flavours including black vanilla and the on-trend salted caramel. Located right next to the Bear Park. 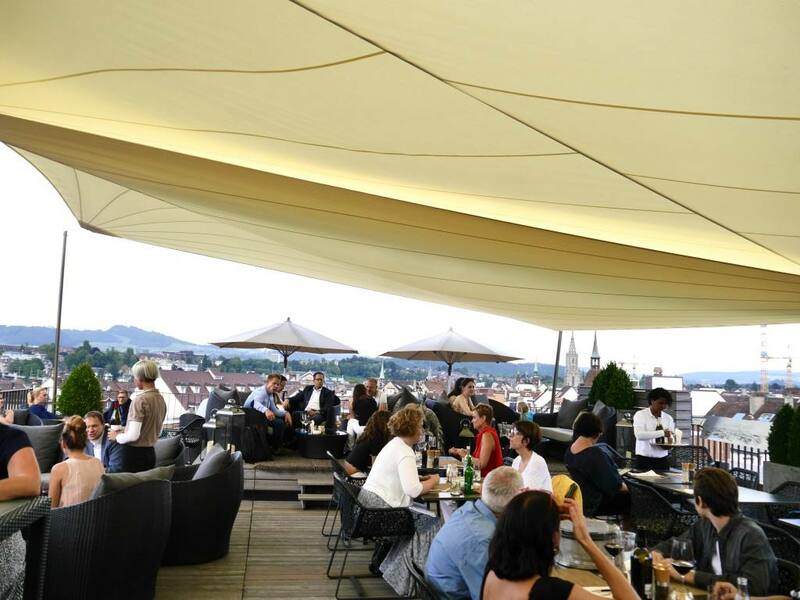 The newly-opened Sky Terrace has fast become one of the most in-style places to hang out in Bern. Local’s flock to the Sky Terrace for drinks, aperitifs and open air dining. 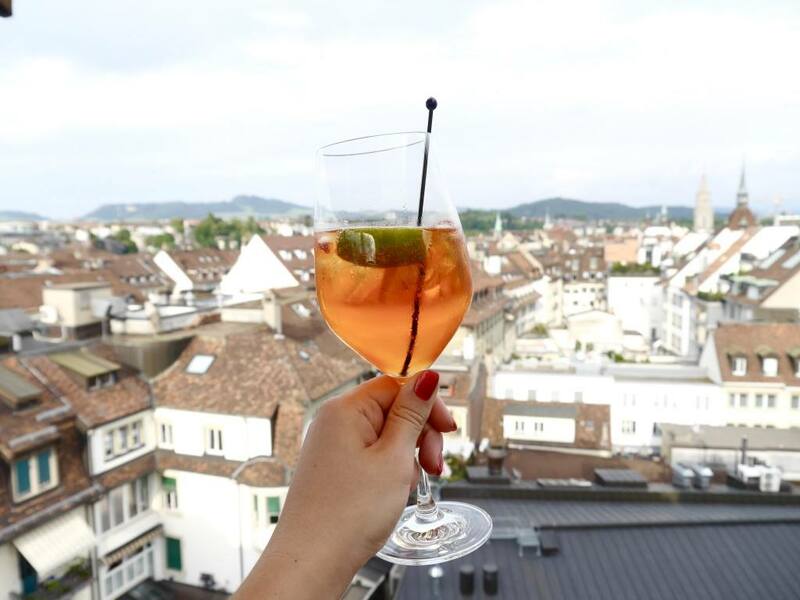 The chic rooftop bar has 360 degree views of the city and is situated on the top floor of the luxury Schweizerhof Hotel. Non-guests are welcome. 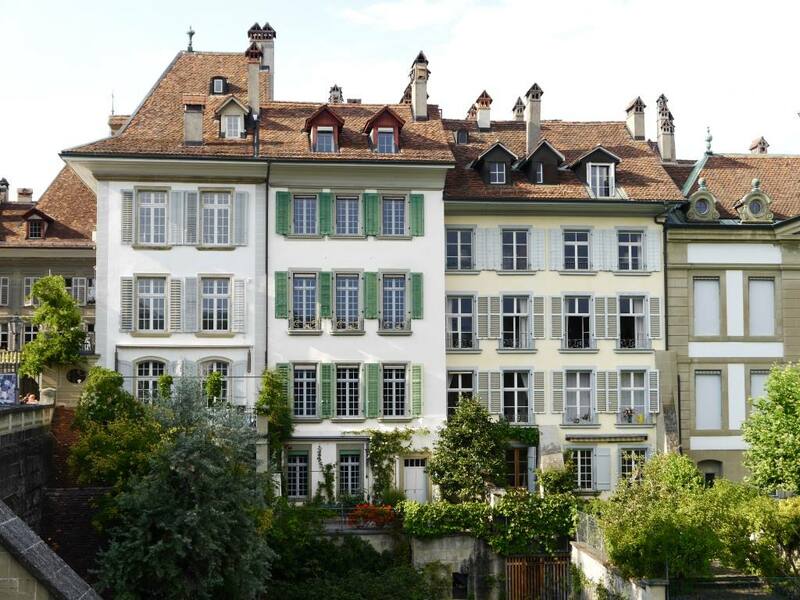 For timeless 5-star luxury there is only one clear choice in Bern. Bellevue Palace is incredibly central and located right next to the parliament buildings so is often home to the world’s politicians and A-list. The service goes above and beyond and the entire hotel feels incredibly palatial. I stayed at the Bellevue Palace during my trip to Bern and couldn’t fault it in any way. Try to book a room or suite facing the river for incredible balcony views. This is a fine 5 star hotel. Book Now. For something a little more contemporary but equally luxurious, check out the newly refurbished Schweizerhof. 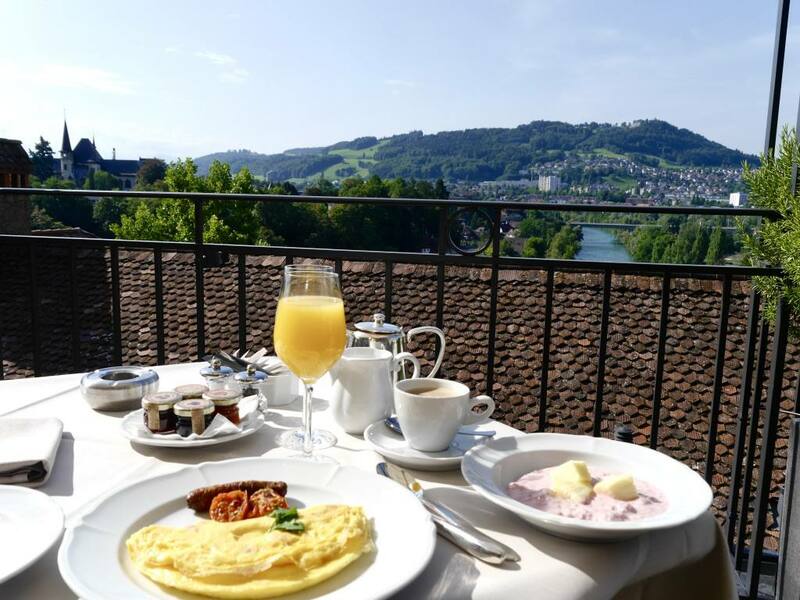 This hotel is located right next to Bern train statin and has recently added a new underground Spa and the super chic Sky Terrace. The foodie offerings are also very strong with Jack’s Brasserie and a new ramen noodle menu available in the lobby. Book Now. 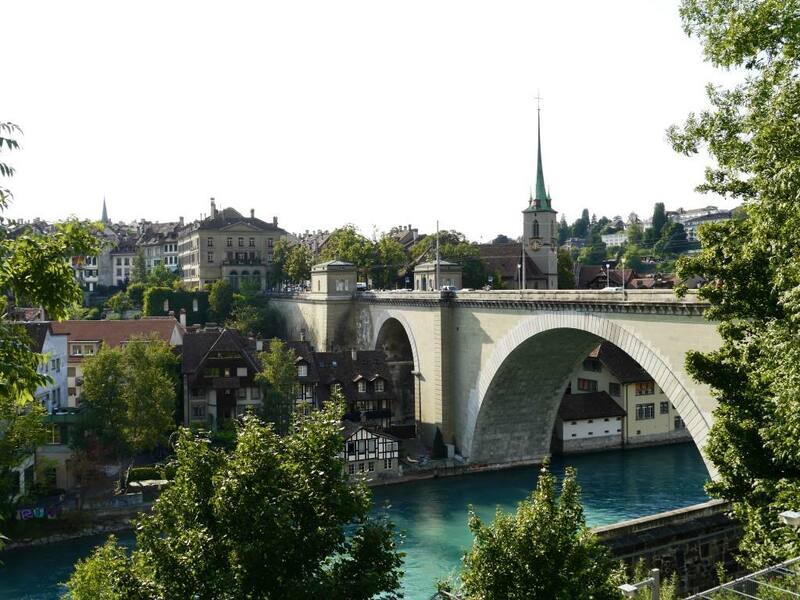 For more information and top tips about Bern be sure to visit the Bern Tourism website. 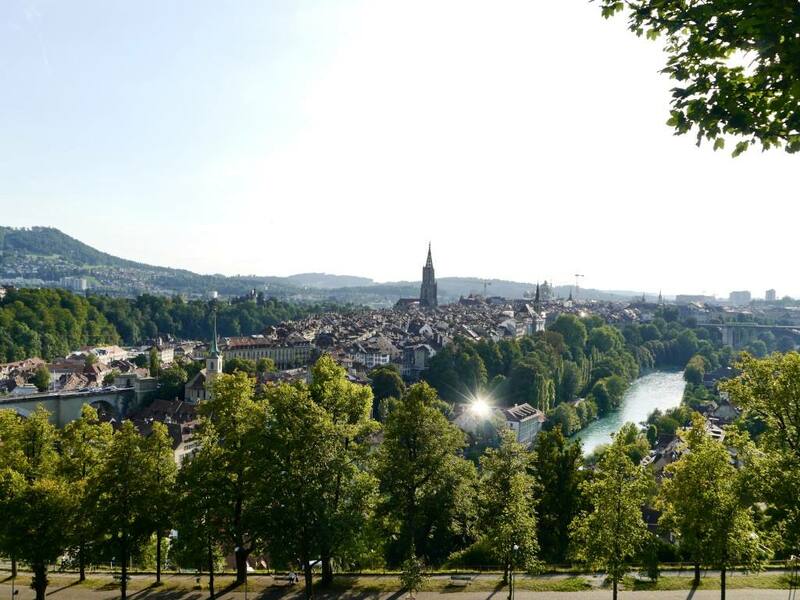 This City Break Guide to Bern is a sponsored post written in collaboration with Switzerland Tourism and Bern Tourism. All words, views and images are my own. Switzerland looks amazing! I’m hoping to plan a trip there next summer! LOVED this post lady! Your city guides are always my favourite and I’m SO glad to see that you’re loving solo travel too, knew you would! <3 Bern is firmly on my list of places to visit now! I lived Bern when I visited as it’s such a beautiful place and after seeing your photos I’m now really eager to go back. Sounds like I definitely need to revisit… Last time I was there the Bear park didn’t exist and they were still in a pit so I’m glad to see they are now living in a better environment, but that there are still bears in Bern. It genuinely looks like an incredible city. This looks absolutely amazing! I would love to visit Switzerland. You’re so brave doing solo trips, I literally aspire to be able to do that! Wow, Bern looks stunning! I can’t wait to visit Switzerland soon. Looks like such a beautiful city. And the colour of that river! I would want to swim in it every too if it looked like that!